Explore the depths of marine wonder! Ivation is proud to present this advanced dual-layer neoprene wetsuit. Designed for everything from deep-water diving to sports activities in the harshest environments, the full-body skin adds a layer of exceptional protection and comfort for all adventures. 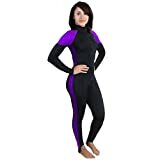 The base layer suit is ideal for blocking out the sun's harsh UV rays, so you can scuba dive and snorkel for hours without risking a dangerous burn. The premium neoprene layer optimizes flexibility and movement, and its perfectly contoured fit reduces drag when underwater. The full-body design perfectly complements your other underwater protective gear, optimizing performance in diving, snorkeling, swimming, surfing, and more. The base layer protects you from jellyfish, sea lice, and other deep-sea parasites. Underwater and above it, the complete body coverage provides you with a reliable defense against the sun's deadly rays. In colder conditions, the base layer adds additional warmth to keep your body temperature in performance range. The suit's nylon (80%) and spandex (20%) material blend makes for a soft, stretchy feel that won't irritate your skin like other form-fitting suits. At the bottom, stirrups wrap your feet to ensure that the suit's legs don't bunch up while you're active. While the skin fits like a glove, it features a full-length front zipper that's ideal for quick changing. The material's flexibility also helps. Best of all, the base layer's smooth, seamless finish makes it easier to slip your wetsuit layer on top in seconds. Have other wetsuits made you feel like you were in a straightjacket? Then you'll love the freedom of movement and unequaled range of motion made possible by our wetsuit.